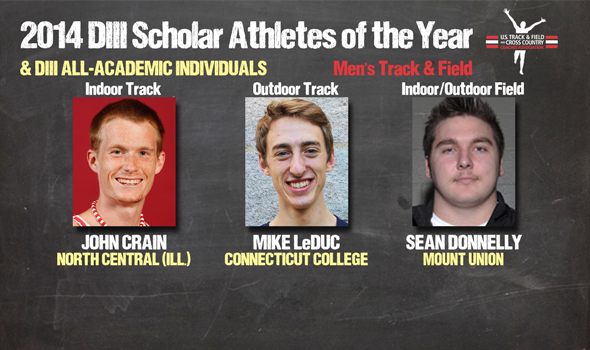 NEW ORLEANS – John Crain of North Central (Ill.), Mike LeDuc of Connecticut College and Sean Donnelly of Mount Union have been named the men’s Scholar Athletes of the Year in Division III for the 2013-14 track & field season by the U.S. Track & Field and Cross Country Coaches Association (USTFCCCA), the association announced Tuesday. Taking into account their accomplishments both in the classroom and in competition during the recently completed academic year, these three men stood out among a class of 276 who earned USTFCCCA All-Academic honors. The full breakdown of All-Academic selections can be found below. Crain, a senior sociology/criminal justice major with a 3.37 cumulative GPA, became the first runner in North Central’s history to earn the distinction of indoor track Scholar Athlete of the Year after racing to national titles at both 5000 and 10,000 meters at the NCAA Indoor Championships. The Dunlap, Ill., native is the second overall male from North Central to earn Scholar Athlete of the Year honors, joining 2011 outdoor field winner Peter Geraghty. LeDuc, a senior botany major with a 3.80 cumulative GPA, earned the outdoor track Scholar Athlete of the Year award for a second consecutive season following a successful defense of his 3000-meter steeplechase title at the NCAA Outdoor Championships. The Canton, Conn., native is the first track athlete to have won back-to-back awards, and just the second man overall between either track or field. He also earned the award during the cross country season earlier this academic year. Sweeping both the indoor and outdoor field awards was Donnelly, a junior exercise science major with a 3.63 cumulative GPA. The native of Willoughby, Ohio, became the first DIII man to earn both the indoor and outdoor field Scholar Athlete of the Year honors in the same year after winning both the shot put and the hammer throw national titles at the NCAA Outdoor Championships to lead Mount Union to the national team title. Indoors he won the weight throw to lead his Purple Raiders to a fifth-place team finish. Including the Scholar Athletes of the Year, a total of 276 men from 100 institutions earned USTFCCCA All-Academic honors for their combined academic and athletic accomplishments. Indoor national champion UW-La Crosse posted a nation-leading 17 All-Academic honorees, joining MIT with 12 as the only two programs with double-digit representation. The WIAC topped the list of conferences with 43 total awards earned by its member institutions, followed by the NESCAC with 37. Four different men recorded a cumulative GPA of 4.0. Conrad Bollinger Principia 3.75 Business Admin.